For the sake of his study, which was recently published in Astrobiology under the title Space Dust Collisions as a Planetary Escape Mechanism, Prof. Berera examined the possibility that space dust could facilitate the escape of particles from Earth’s atmosphere. These include molecules that indicate the presence of life on Earth (aka. biosignatures), but also microbial life and molecules that are essential to life. The study which detailed their findings, titled HS 2231+2441: an HW Vir system composed by a low-mass white dwarf and a brown dwarf, was recently published the MNRAS. The team was led by Leonardo Andrade de Almeida, a postdoctoral fellow from the University of São Paolo’s Institute of Astronomy, Geophysics, and Atmospheric Sciences (IAG-USP), along with members from the National Institute for Space Research (MCTIC), and the State University of Feira de Santana. For the sake of their study, the team conducted observations of a binary star system between 2005 and 2013 using the Pico dos Dias Observatory in Brazil. This data was then combined with information from the William Herschel Telescope, which is located in the Observatorio del Roque de los Muchachos on the island of La Palma. This system, known as of HS 2231+2441, consists of a white dwarf star and a brown dwarf companion. Beyond the Earth-Moon system, thousands of asteroids known as Near-Earth Objects (NEOs) are known to exist. These rocks periodically cross Earth’s orbit and make close a flyby of Earth. Over the course of millions of years, some even collide with the Earth, causing mass extinctions. Little wonder then why NASA’s Center for Near Earth Object Studies (CNEOS) is dedicated to monitoring the larger objects that occasionally come close to our planet. One of these objects is 2012 TC4, a small and oblong-shaped NEO that was first spotted in 2012 during a close flyby of Earth. During its most recent flyby – which took place on Thursday, October 12th,2017 – an international team of astronomers led by NASA scientists used the opportunity to conduct the first international exercise to test global responses to an impending asteroid strike. This exercise was known as the “TC4 Observation Campaign“, which began this past July and concluded with the asteroid flyby. 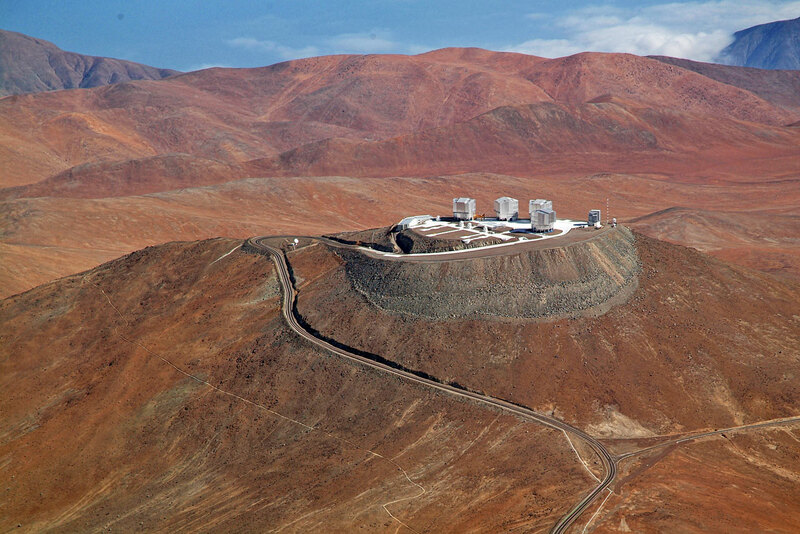 It all began when astronomers at the European Southern Observatory’s (ESO) Paranal Observatory in Chile used the Very Large Telescope (VLT) to recover 2012 TC4. When the asteroid made its final close approach to Earth in mid-October, it passed Earth by at a distance of 43,780 km (27,200 mi). Ever since the discovery of Sagittarius A* at the center of our galaxy, astronomers have come to understand that most massive galaxies have a Supermassive Black Hole (SMBH) at their core. These are evidenced by the powerful electromagnetic emissions produced at the nuclei of these galaxies – which are known as “Active Galatic Nuclei” (AGN) – that are believed to be caused by gas and dust accreting onto the SMBH. The study, Tidally disrupted dusty clumps as the origin of broad emission lines in active galactic nuclei, recently appeared in the scientific journal Nature Astronomy. The study was led by Jian-Min Wang, a researcher from the Institute of High Energy Physics (IHEP) at the Chinese Academy of Sciences, with assistance from the University of Wyoming and the University of Nanjing. In the past thirty years, thousands of extra-solar planets have been discovered beyond our Solar System. For the most part, they have been detected by the Kepler Space Telescope using a technique called Transit Photometry. For this method, astronomers measure periodic dips in a star’s brightness – which are the result of planets passing in front of them relative to an observer – to confirm the presence of planets. The study which details their findings, titled Likely Transiting Exocomets Detected by Kepler, recently appeared in the Monthly Notices of the Royal Astronomical Society. Led by Saul Rappaport of MIT’s Kavli Institute for Astrophysics and Space Research, the team also consisted of amateur astronomers, members of the Harvard-Smithsonian Center for Astrophysics (CfA), the University of Texas, Northeastern University, and NASA’s Ames Research Center. But thanks to a time-tested technique called trigonometric parallax, a team of astronomers from the Max Planck Institute for Radio Astronomy (MPIfR) in Bonn, Germany, and the Harvard-Smithsonian Center for Astrophysics (CfA) were recently able o directly measure the distance to the opposite side of the Milky Way Galaxy. Aside from being an historic first, this feat has nearly doubled the previous record for distance measurements within our galaxy. This most recent study, titled The Dehydration of Water Worlds via Atmospheric Losses, recently appeared in The Astrophysical Journal Letters. Led by Chuanfei Dong from the Department of Astrophysical Sciences at Princeton University, the team conducted computer simulations that took into account what kind of conditions water worlds would be subject to.